Two, four or six, 750 ml bottles of hand-crafted, limited release, artisanal beers from two of the world’s best brewers. You’ll get two different beer styles, one, two or three bottles from each brewery. Simply put, The Rare Beer Club’s mission is to deliver the best, most inventive, and most hard-to-come-by beers out there. Founded by the late beer critic Michael Jackson, the world's leading authority on beer, The Rare Beer Club offers limited-release craft beers from both the U.S. and around the world. In fact, many of our featured beers are created exclusively for the club and can’t be found anywhere else, such as Jolly Pumpkin’s L’épouvantail Noir (Oak-Aged Saison with Pumpkin & Blackberries), American Solera’s The Ground Is Shaking! (Flemish-Inspired Sour Brown Ale aged in Vin Santo Wine Casks), Upright Brewing’s August IPA (IPA/Saison Hybrid with Wild Yeast), Alesong’s Raspberry Gose (German-Style Gose with Sea Salt, Coriander & Raspberries), and many, many more! Each monthly shipment also includes our Rare Beer Club newsletter, providing each brewery’s history, profiles of the brewers, detailed tasting notes, food pairing and beer aging recommendations, and beer specs including style, special ingredients, ABV, recommended serving temperature, and more. Additionally, all Rare Beer Club members can re-order their favorite beers while supplies last! Sometimes we come across incredible beers that we’d like to feature, but the amounts available are just too small. 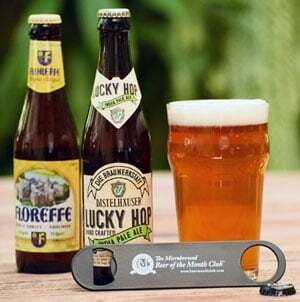 In addition to our normal monthly selections, Rare Beer Club members can also take advantage of our periodic special offers on these additional exciting and hard-to-find beers.